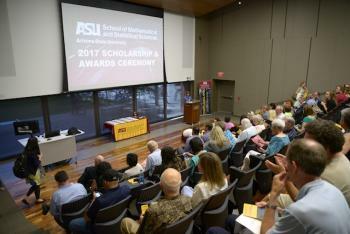 The School of Mathematical and Statistical Sciences at Arizona State University is dedicated to providing quality instruction and being a powerhouse of research in the mathematical and statistical sciences. We embrace the challenge of teaching mathematics to students with a wide variety of backgrounds, abilities and needs. We provide excellent training for careers in science, technology, medicine, law, business, and many other professions. The school is truly a vibrant community of scholars who are learning about and solving some of the most interesting theoretical and applied mathematical problems of our time. The School of Mathematical and Statistical Sciences houses a small group of statisticians, but intends to expand this group and form a new department of statistics. This department will also collaborate with other statisticians on campus, such as those in the Ira A. Fulton Schools of Engineering and the W.P. Carey School of Business. With a strong emphasis on interdisciplinary research and an abundance of data, administrators have acted on calls from the research community for increasing the number of statisticians, which has resulted in the current plans. Among the degrees offered are a BS in Mathematics with a concentration in Statistics, as well as MS and PhD degrees in Statistics. The School is currently home to about 25 PhD and 35 MS students in statistics, which are numbers that are expected to grow along with the number of statistics faculty. The School also offers a Certificate in Statistics, which is aimed at graduate students from other disciplines who are interested in earning recognition for their expertise in statistics based on having met course requirements for the certificate.